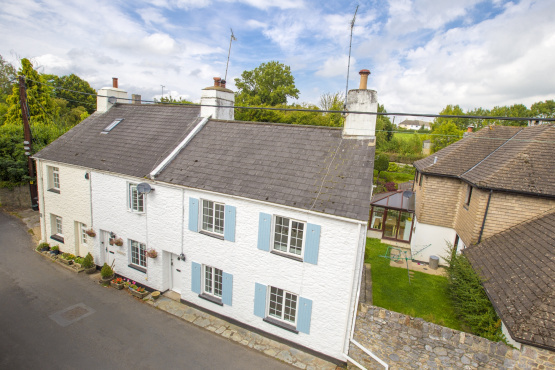 Sheldron Cottage is a beautiful, recently renovated end of terrace cottage, located in the heart of the pretty and sought after village of Broadhempston. The front door opens into a hallway with stairs leading to the first floor and windows to the rear. The large living room boasts a multi-fuel log and coal burner set in a stone hearth and surround, with two windows to the front. This leads through to a bright utility room perfect for all your white goods and with views over the garden. A superb newly fitted shaker style kitchen/dining room completes the ground floor with integrated appliances, oak work surfaces and a ceramic sink, a charming finish for this county kitchen. Two windows plus patio doors open out to the garden creating a light and airy feel. The upstairs accommodation consists of two double bedrooms with views to the front of the property and the family bathroom. Outside the rear garden has a stone paved area with steps up to a level lawn. There is allocated parking which can be found at the end of the row of cottages. Broadhempston is centred around a local village shop, two popular public houses, the 15th century Church of St Peter and St Paul and the respected ofsted awarded ‘outstanding’ Primary School. The village is convenient for both Totnes and Newton Abbot and is readily accessible to Torbay. There is excellent access to the A38 Devon Expressway, linking Plymouth and Exeter where it joins the M5. Sheldron Cottage is offered to the market with a guide price of £250,000. If you require a full colour brochure, together with floor plans, or would like to arrange a viewing, please contact the sole agent, Marchand Petit at Totnes on 01803 847979.